It’s summertime, and with the longer days and warmer weather, we are reminded to have fun with our spouse. That’s not always easy. When there are financial pressures to manage, children or grandchildren to worry about, and work or other obligations that demand our time and attention, our spouse sometimes ends up at the bottom of our list. However, finding time to spend with our spouse in a fun and loving way helps sustain the closeness of the unique relationship, which was the basis for the marriage in the beginning. We would not have married someone we didn’t like or have interests in common with, but as the pressures and stresses of life build up, it seems the fun might wane, and we might forget why we are together. In the beginning, couples likely do not anticipate such a change from the fun of marriage to the responsibility. And yet, after the wedding and the honeymoon, the reality of marriage sets in. Adding children to the mix can invigorate, as well as complicate, a marriage. Unfortunately, as the length of the marriage increases, so do the issues and problems a couple faces. Hopefully, couples have the resources necessary to withstand these difficulties, and they do not succumb to the seemingly all-too-common feeling that they have nothing in common, with little reason to stay together. In light of this, marriage researcher Arthur Aron states that finding fun in marriage, through engaging in experiences with our spouse that are novel and unique, activates the reward center of the brain, helping each person in the relationship feel more connected to the other, as well as increasing his or her own sense of well-being. This weekend, talk with your spouse about having fun during the month of June. Plan a date night, even if it’s just a trip to get an ice cream cone and a walk around a lake together. Make time to enjoy each other’s company. 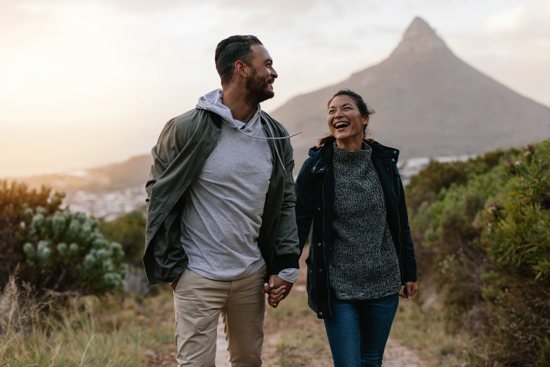 The month of June is a great time to participate in novel outings that can serve to unite you and your spouse by creating the very experiences that will help reignite your love for each other. You could plan a trip out to dinner that involves a carriage ride in the park, or go to an outdoor concert with food trucks that serve all sorts of delicious dinner options. You could take a drive to the country, away from city lights, and enjoy star-gazing. Or you could explore a new area together and stop for lunch at a small-town restaurant and just enjoy the scenery and quiet of each other’s company. The key, Aron states, is to do something out of the ordinary that helps you to be in the moment, not distracted by cellphones, deadlines or other interruptions, so you can enjoy each other’s company in an innovative, special way. As the reward-center of the brain lights up, the natural response infuses the marriage with a spark that reminds the couple why they fell in love in the first place. As adults, it’s important that we continue to play and involve ourselves in pleasurable activities, especially with our spouse. In doing so, we build closeness and camaraderie with this very special person in our life, as well as engage that reward-center of our brain. As the brain releases chemicals that help us feel good, we also provide a loving example for our children regarding the importance of continuing to have fun in marriage, as well as in adulthood in general. Think back to when you were dating and whatever your favorite activities were at that time. Talk about how you can reinvigorate your marriage by taking out your hiking boots, your softball glove or your running shoes, and then make a plan to spend some precious time together this week or weekend. Summer is finally here, and we must joyously welcome these longer days, warmer temperatures and all the enjoyment this season offers us. Commit yourself to having fun with your spouse and reap the rewards of this very special relationship.